Everyone is facing some type of battle. The Jesus items are a wonderful gift idea. 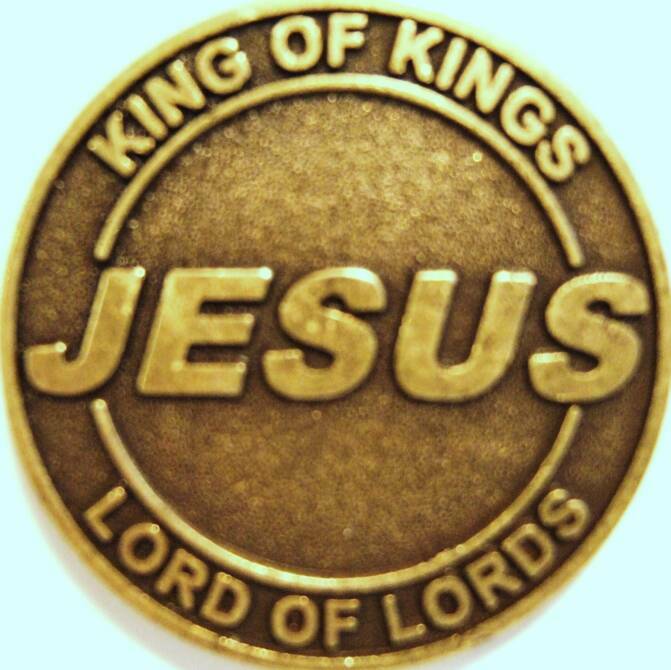 It provides a tremendous amount of peace and comfort to know, first of all, THE BATTLE IS THE LORD'S, and when wearing the pendant or carrying the Jesus coin, it is a wonderful reminder that the enemy has no power over us because we are dressed in the FULL ARMOR OF GOD and JESUS is with us! The Holy Spirit design is your reminder to listen to the voice of the Good Shepherd and not follow the voice of the stranger, as stated in John 10:1-5, He calls His own sheep by name and leads them out. When He has brought all His own, He goes on ahead of them, and His sheep follow Him because they know His voice. But they will never follow a stranger; in fact, they will run away from him because they do not recognize a stranger's voice. 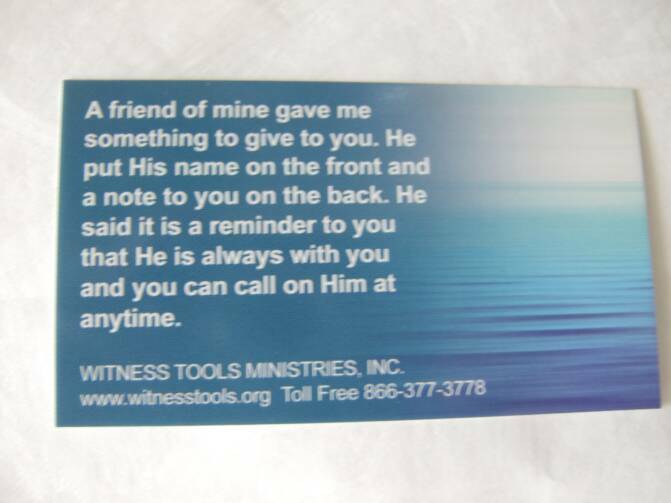 Purchases can be made with Credit Card, PayPal or mail a check to Witness Tools Ministries, Inc. If you are not 100% satisfied with our products you may return them for a full refund within 30 days of purchase. This site was built on Homestead. Great prices! 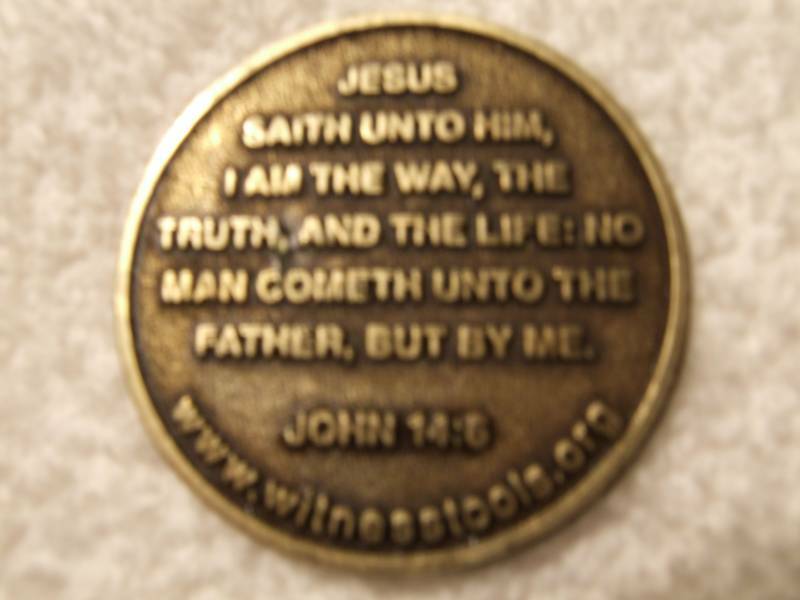 The JESUS coin, a 1 1/2 inch coin with an antique brass finish, is only $3.50 each. NOTE: This coin has the www.witnesstools.org web site on the back side. For youth ministries, hospice, pastors, or individuals who would like to bless someone with this coin, quantity pricing is listed below. The Jesus coin, 1 1/2 inch, is a wonderful reminder to us as you feel it in your pocket or see it on your desk, that our King, our Lord and Savior is with us always. A reminder that the only way to the Father is through Jesus, The Son of God. This coin is also a fabulous witness tool to help someone that is going through a crisis or depression to help them stand strong in their faith. WANTED: Gift Shops, Fund Raisers. Email us for details. The JESUS Tag is only $3.45 each with Ball Chain. 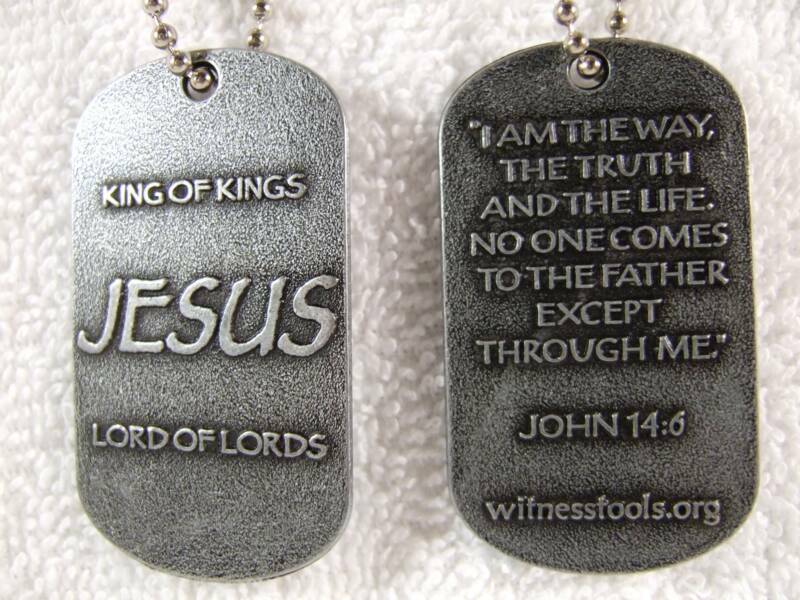 The JESUS Tag is only $1.44 each, in lots of 25, with Ball Chain & FREE ground shipping in the USA. 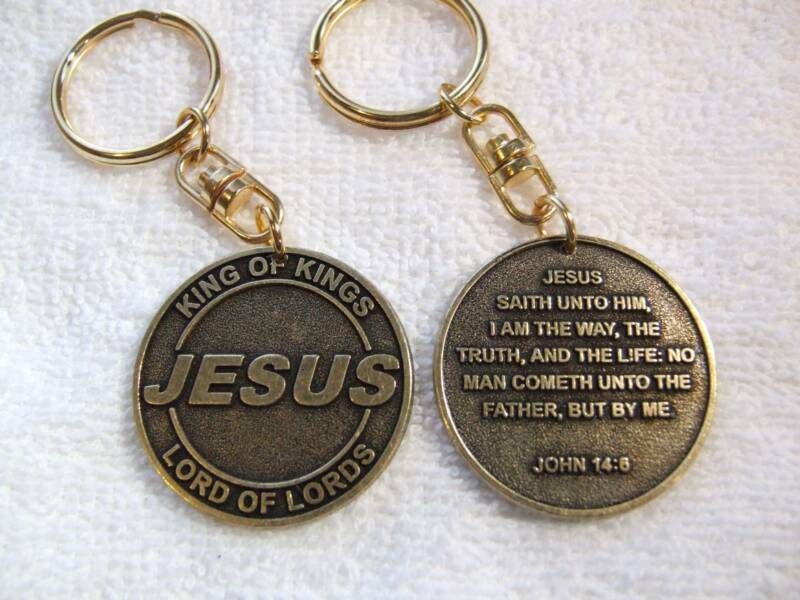 The JESUS Tag is only $1.42 each, in lots of 50, with Ball with Chain & FREE ground shipping in the USA. The JESUS Tag is only $1.40 each, in lots of 100, with Ball with Chain & FREE ground shipping in the USA. Jesus Coins available with your web site in place of ours on the back of the coin. Contact Bob, bob@witnesstools.org for more information. Add Blue card, as seen below, to your Jesus coin order at NO CHARGE. Just add a note to the seller to add the cards with your order. THE CARD: A friend of mine gave me something to give to you. He put His name on the front and a note for you on the back. He said it is a reminder to you that He is always with you and you can call on Him at anytime. The JESUS coin is only $3.60 each. NOTE: This coin does not have a web site on the back side. For youth ministries, hospice, pastors, or individuals who would like to bless someone with this coin, quantity pricing is below. The JESUS coin is only $.60 each with FREE ground shipping in the USA for a lot of 100 coins, WT 610. NOTE: This coin does not have a web site on the back side. The JESUS coin is only $1.08 each with FREE ground shipping in the USA for a lot of 25 coins, WT 625. NOTE: This coin does not have a web site on the back side. The JESUS coin is only $.60 each with FREE ground shipping in the USA for a lot of 500 or more coins, WT 630. NOTE: This coin does not have a web site on the back side. Add Blue card, as seen to the right, to your Jesus coin order at NO CHARGE. Just add a note to the seller to add the cards with your order. Jesus Coins without our web site. Email us if you want the FREE blue cards with your order. OR you can order your own cards from www.vistaprint.com. Pictured without the web site. The Pendant is two sided just like the coin. NEW! Jesus products without our web site. Email us if you want the FREE blue cards with your order. OR you can order your own cards from www.vistaprint.com. Click Here to see the back of the card. Back side of Blue card. 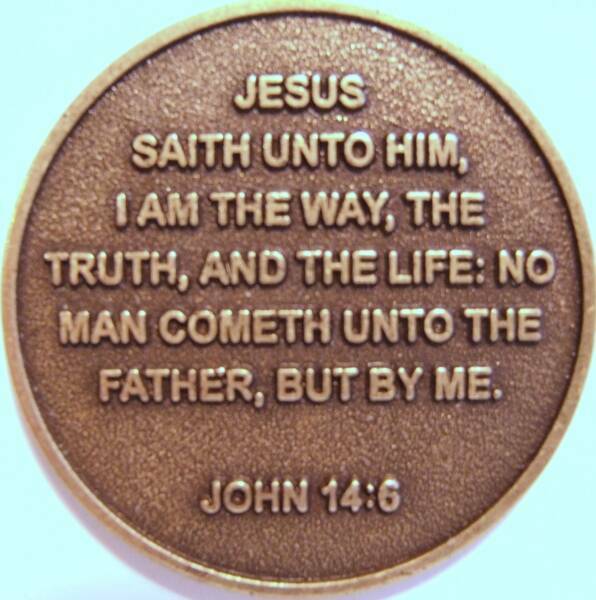 NEW JESUS COIN WITH THE PRAYER OF SALVATION ON THE BACK!!!!!! The JESUS Salvation coin is only $1.08 each with FREE ground shipping in the USA for a lot of 25 coins, WT 725. NOTE: This coin does not have a web site on the back side. The JESUS Salvation coin is only $.60 each with FREE ground shipping in the USA for a lot of 500 coins, WT 730. NOTE: This coin does not have a web site on the back side. The JESUS Salvation coin is only $.60 each with FREE ground shipping in the USA for a lot of 100 coins, WT 710. NOTE: This coin does not have a web site on the back side. The youth package is only $5.37. The JESUS Tag is only $3.60 each with Ball Chain, American Flag Silencer. The JESUS Tag is only $3.60 each with Ball Chain, Black Silencer. The JESUS Tag is only $3.60 each with Ball Chain, Blue Silencer. The JESUS Tag is only $3.60 each with Ball Chain, Candy Cane Silencer. 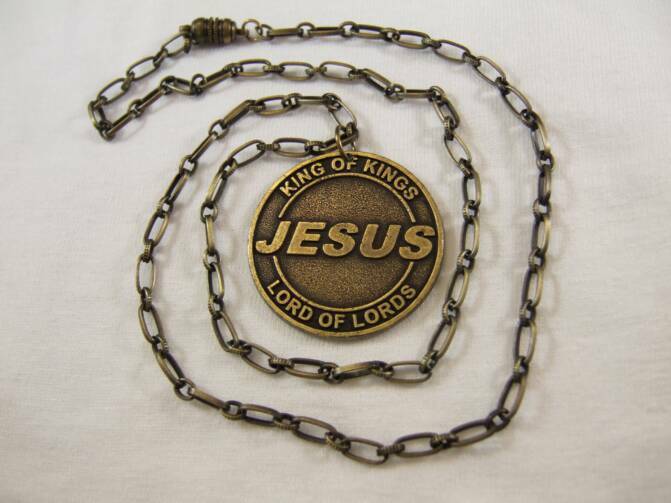 The JESUS Tag is only $3.60 each with Ball Chain, Green Silencer. The JESUS Tag is only $3.60 each with Ball Chain, Orange Silencer. The JESUS Tag is only $3.60 each with Ball Chain, Pink Silencer. The JESUS Tag is only $3.60 each with Ball Chain, Purple Silencer. The JESUS Tag is only $3.60 each with Ball Chain, RED Silencer. The JESUS Tag is only $3.60 each with Ball Chain, WHITE Silencer. The JESUS Tag is only $3.60 each with Ball Chain, YELLOw Silencer.